A nutritious game day option! “Are you ready for some football?” If you’re a big football fan, or have a significant other, brother or son who is, I’m sure this infamous jingle is running through your head. Football season is upon us, people! If you’re not excited, you can guarantee that about 90 percent of America is! With that, it’s time to stop excluding yourself from the big old Sunday pigskin gatherings, be it to avoid the usually unhealthy offerings or because it’s just plain old boring to you. It’s time to join in the festivities! Why? Because you get to spend some quality time with some great people! OK, want the real reason, the obviously more important reason? Because I’m going to provide you with an absolutely delicious and perfect recipe for game day that will just send balls in a perfect spiral!! That’s right, we’re making skins for skins! Eh hem, potato skins for pigskins, that is! 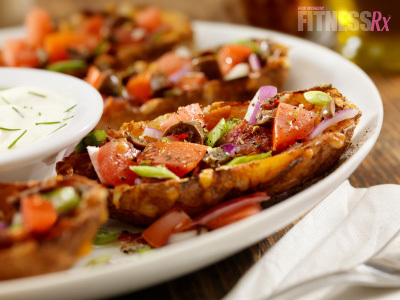 These potato skins are the perfect addition to game day with the boys… and girls! They are super easy to eat and the best part is your guests won’t even know that they are healthy! Yes, even you can eat them guilt-free! Watch their faces as you sink your teeth into these treats that only appear unhealthy. These snacks have gotten a bad rap because they are typically loaded with gobs of cheese, bacon, sour cream, etc. Well, not on my stopwatch! It’s time to recreate these bad boys into nutritious ones… just leave it up to me! 2. Place a piece of tin foil on a cookie sheet and arrange skins on top. Put back in the oven and bake at 350 degrees for 10 minutes. 3. In the meantime add tomato, green bell pepper, red onion, chives, black olives, cilantro, black pepper, garlic, cumin and sea salt to a mixing bowl. Mix all ingredients until thoroughly blended. Set aside. 4. Once potatoes have been in the oven for 10 minutes (to slightly harden/dry out before adding the wet ingredients), remove and evenly spoon in the salsa amongst each half. Then, divide the chicken evenly on top of the salsa. 5. Next, evenly spoon in the tomato, veggie, and herb mixture from the mixing bowl, ensuring that each half gets the same amount. 6. Finally, evenly sprinkle on the low-fat cheddar shreds amongst each half. 7. Put back in the oven for approximately 20 minutes until cheese is fully melted and skins are golden brown. It’s game time!